From the New York Times bestselling creator of the hugely popular Awkward Yeti comics comes the third collection in his Heart and Brain series. 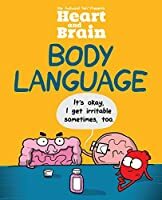 Heart and Brain: Body Language continues the adventures of the loveably conflicted sentimental Heart and rational Brain, as well as other bodily inhabitants like Gallbladder, Muscle, and Tongue. Warm-hearted and laugh-out-loud funny From the New York Times bestselling creator of the hugely popular Awkward Yeti comics comes the third collection in his Heart and Brain series. Warm-hearted and laugh-out-loud funny, these comics bring our inner struggles to vibrant, humorous life. This compilation of the comic strips of Heart and Brain's repartee are really hilarious to read. 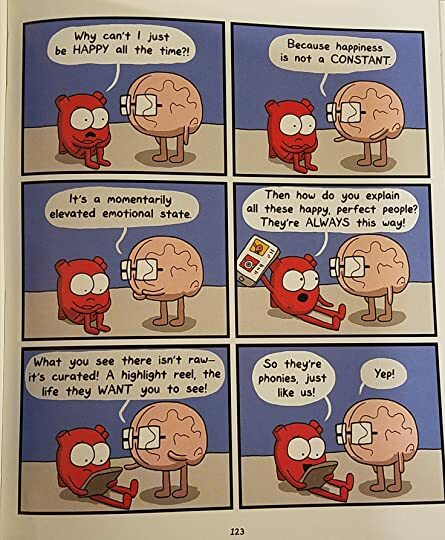 Also, I've learnt that there are previously published books of the The Awkward Yeti; I'll try to check those later and indulge myself with a good laugh. Lastly, I can relate to Brain's personality because I'm an introvert, a bookworm, and I carefully plan everything first unlike Heart. 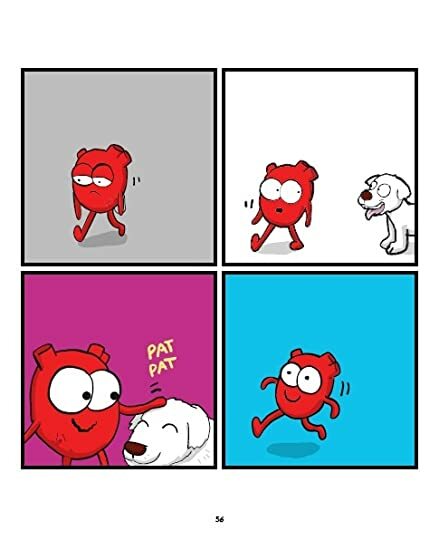 Yet, I have the some characteristics of Heart also, for instance he likes relaxation and animals such as dogs and ot This compilation of the comic strips of Heart and Brain's repartee are really hilarious to read. 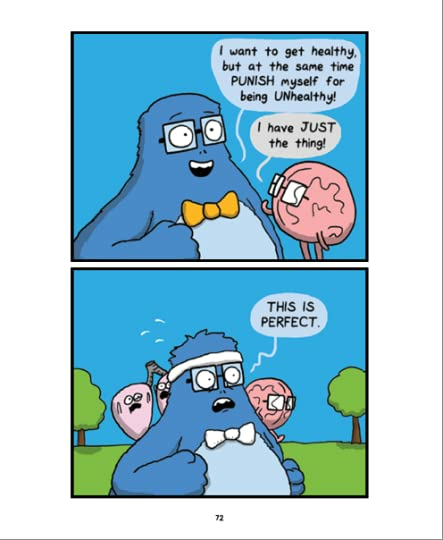 Also, I've learnt that there are previously published books of the The Awkward Yeti; I'll try to check those later and indulge myself with a good laugh. Lastly, I can relate to Brain's personality because I'm an introvert, a bookworm, and I carefully plan everything first unlike Heart. Yet, I have the some characteristics of Heart also, for instance he likes relaxation and animals such as dogs and other pets. So, after all, I'm really a mixed of Brain and Heart. 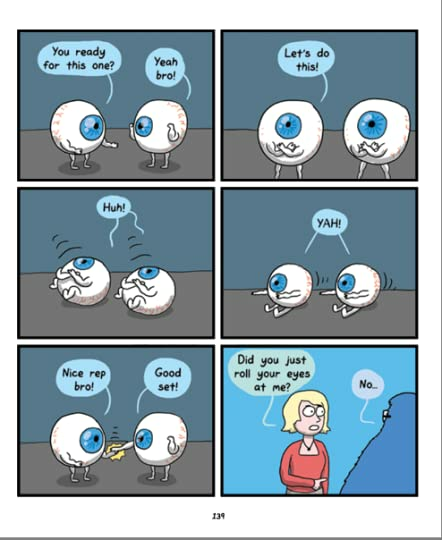 This comic strip collection by Awkward Yeti is a must read if you like comics. The brightly colored pictures and funny dialogues between heart, brain and other body organs are fun to read. Thanks to Net Galley and Andrews McMeet Publishing for the eARC of this comic in exchange for an honest review. This comic is just what I needed this week. And so many fewer calories than #sheetcaking! Every time I would listen to some news, I'd turn to Heart, Brain, and their body buddies to lift me back up. Since this is the first time I've read one of these books, I'm now looking forward to going back to the earlier books. Maybe this way I'll survive all the crazy in our world. Thanks to NetGalley and Andrews McMeel Publishing for a digital advanced readers copy in exchange for my always honest review. For me, Heart and Brain is always a win. I really enjoy this comics strip. The struggle between them is so fun, and when other organs enter to the formula, just work. Maybe the reason why I love it is because I eat a lot, I’m almost blind and I hate exercise (even when I do it almost every day) so, this is accurate for me. I’m pretty sure that, if my organs could speak, probably the conversation will be similar to this book, and I’ll fight side to side with them, supporting the one that made me h For me, Heart and Brain is always a win. I really enjoy this comics strip. The struggle between them is so fun, and when other organs enter to the formula, just work. Maybe the reason why I love it is because I eat a lot, I’m almost blind and I hate exercise (even when I do it almost every day) so, this is accurate for me. 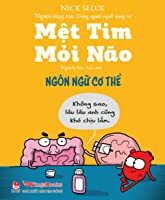 I’m pretty sure that, if my organs could speak, probably the conversation will be similar to this book, and I’ll fight side to side with them, supporting the one that made me happy and not the one that is healtier...or sametimes doing the exactly opposite. That's the fun part, that even when this isn't a surprise, is always enjoyable. Honestly this webcomic is so much fun one of the few that I can read over and over and do not get tired of it, and want more of it. This year I found this comic strip and I do not want to let it go never (I also want a teddy brain, but shipping is so expensive ...so i need time to convince my sister that bring it with her). Conclusion: If you want to spend a good time, this book is for you! 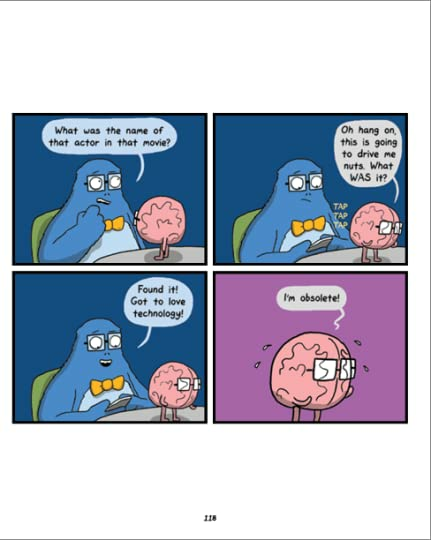 I follow "The Awkward Yeti" on Instagram, so i already knew some of his comics. They are the cutest comics ever and my favorite "character" is obviously heart, because he is so cute. All the comics are so funny and I just love them! This book was provided by the publisher through Netgalley in exchange for an honest review. Thank you Netgalley and Andrews McMeel Publishing! Heart and Brain: Body Language is a graphic novel about the adventures of Heart and Brain. Besides Heart and Brain, you also have Gallbladder, Muscle,Tongue, Eyes,... Heart and Brain: Body Language is about the daily struggles of life. 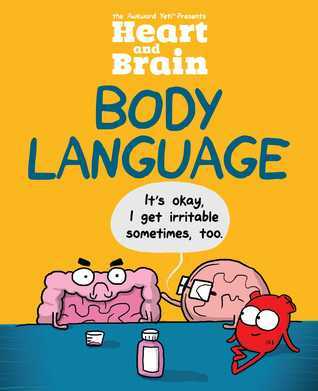 Heart and Brain: Body Language is such a funny and relatable graphic novel! I couldn't stop laughing while going through the comics. It's such a brilliant book and I can't help notice that it's already the third book by Andrews McMeel Publishing that I love! I have always loved heart and brain and this new adventure made me love them even more, I really loved heart's wisdom and the way he goes through life, epic! If you follow The Awkward Yeti's comics like I do, you already know you're looking at a good time with this book. I never get tired of the heart's shenanigans, the brain's desperate attempts to keep everyone in order, or the hilarious relatability of the intestines. Anyone who's got a human body can probably get a laugh out of at least a few of these, so I'd definitely recommend picking this one up if you're a comic reader. Thank you to NetGalley and Andrews McMeel Publishing for the ARC! All opi If you follow The Awkward Yeti's comics like I do, you already know you're looking at a good time with this book. I never get tired of the heart's shenanigans, the brain's desperate attempts to keep everyone in order, or the hilarious relatability of the intestines. Anyone who's got a human body can probably get a laugh out of at least a few of these, so I'd definitely recommend picking this one up if you're a comic reader. Awesomely insightful little cartoons, including the return of the Gall Bladder. Every page feel hilarious and relatable 😂😂 I can't help smile and laugh! Love it! I received digital review copy from Netgalley in exchange honest review! Thank you Netgalley! Heart and Brain are back everyone!!! Love these two :D Always entertaining with their constant battles between smartypants brain and the ever playful heart! Cutely recreated in this bright and colourful graphic novel which is third in the "Heart and Brain" series by Nick Seluk a.k.a The Awkard Yeti. Read just one and you can't help but fall in love with the two cute starring organs and their organ friends. Scientifically accurate (it's educational too!) with witty and realistic repartee is all you need to put a smile in your every day. This is a comic I have read bits and pieces of. When I got the chance to read a whole book, I jumped at it. All of the panels were good. Some were hilarious. I found myself laughing out loud. It was often relatable and always interesting. This was a really fun read and I highly recommend it. I received a free ARC from NetGalley in exchange for my honest review. I love, love, love, love Heart and Brain. This was absolutely what I needed on this terrible hump day in a terrible week. It made me laugh and smile. The art is cute and what can I say, Heart totally gets me. Loved this a lot and can't wait to read more. My only complaint is that it was too short. Need more now! Loved this one! Fun graphic that completely captures the inner struggles of your brain and heart (as well as your gut and some other organs), that often tell you conflicting information.... with some hilarious results. Heart: The third book in the Heart and Brain series is here! Brain: Still as funny as ever! Eyes: Look at the colorful and cute illustrations by Nick Seluk! Gut: What do your stones have to do with this review? Heart: Duh, he's our most popular plushie on our website! Brain: Every book seems to have some panels that perfectly describe you Nancy. Heart: You worry way too much about what other people think of Heart: The third book in the Heart and Brain series is here! Heart: You worry way too much about what other people think of you! Brain: Study page 123 and get some perspective, stat! Brain: Our job is done! Don't forget to read Heart and Brain & Gut Instincts too! Bwahahaha! So funny! So wonderful! 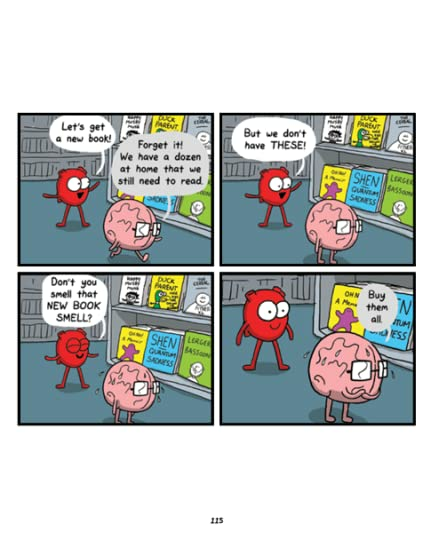 I just love the hilarious antics of Heart and Brain. Each little comic is full of laughter and wit. And I love how even the Eyes, the Tongue, the Gallbladder, the Gut and Stomach, all play a part in the nonsense. The artwork is vibrant and fun, and each little panel brings something entertaining. The best thing about this comic is that the humor is clean and appropriate for all ages. Disclaimer: I received an ecopy of this book from the publisher via NetG Bwahahaha! So funny! So wonderful! 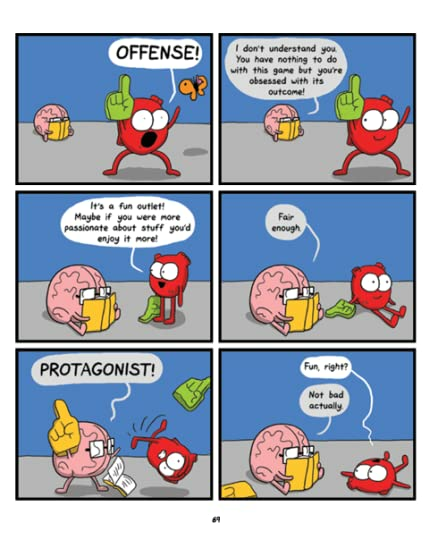 I just love the hilarious antics of Heart and Brain. Each little comic is full of laughter and wit. And I love how even the Eyes, the Tongue, the Gallbladder, the Gut and Stomach, all play a part in the nonsense. The artwork is vibrant and fun, and each little panel brings something entertaining. Funny, witty and 100% relatable I loved this. A big thank you to Netgalley, the Publisher and the Author for this opportunity! 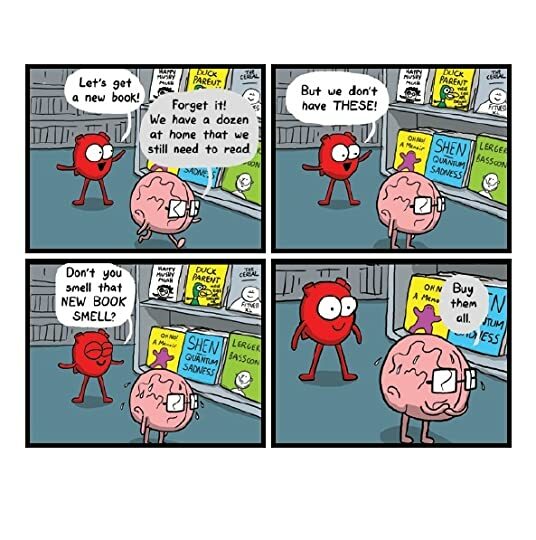 This is the first time I've read any Heart and Brain stuff but I plan to read more by The Awkward Yeti as soon as I can get my hands on them! It's a quick and funny read, relatable and has some laugh out loud bits that I won't tell you about now, you'll have to read it and find out for yourself. This was hilarious. I read it on my way to university and I just couldn't stop laughing. Please, I want more of this, keep them coming. The Awkward Yeti, you got me hooked. I strongly recommend it for anyone who needs a good laugh, you won't regret it, I promise. Another cute volume about the heart/brain divide - no earth-shattering revelations, but enough laughs to be worth a quick read. What can I say? Adorable, humorous, relatable, thoughtful, and joyous. This book keeps up all the charming traits of the previous collections while still maintaining relevancy and avoiding stagnant writing. Another outstanding collection of comics by The Awkward Yeti. The Awkward Yeti has done it again! 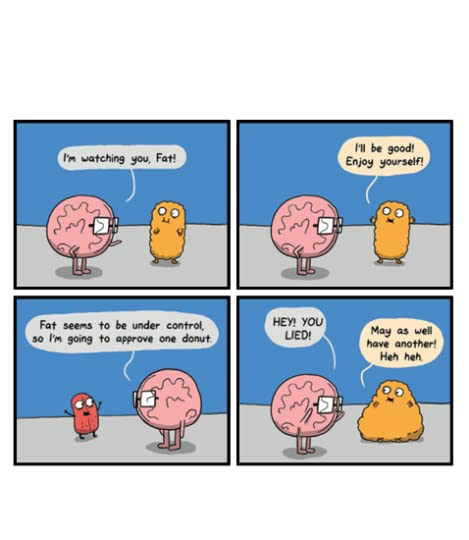 Another collection of 100% relatable struggles as seen through the eyes of our internal--and even external--organs. no llega a ser ácido o irónico como muchos otros cómics y creo que es eso lo que lo resalta o diferencia. Cada tira cómica que trae tiene un mensaje que te hace pensar o simplemente reír. 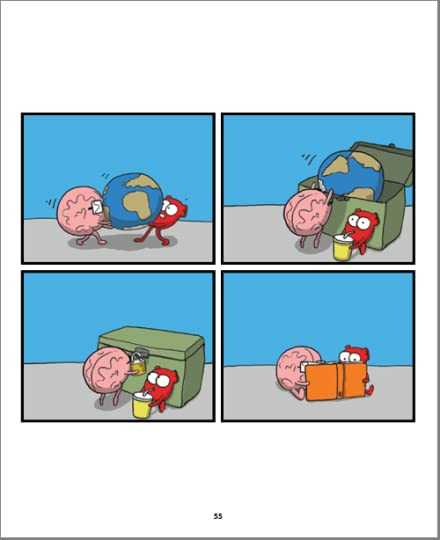 Muchas veces es solo un cuadro que The Awkward Yeti trae y puede ser devastador emocionalmente, en una buena manera. En esta compilación hay muchas imágenes que no había visto y la verdad es que me ha encantado. This is a great series to read when you’re feeling down and you really need something humorous to lighten your day. I needed this very, very much. After finishing five essays of eight pages each (not all in one day, I’m not a robot), you must relax or you’ll snap eventually from all the stress. So I’m not kidding when I say that the world is in need of books such as this one. The best thing is, these two main characters (Heart and Brain) are meaningful ones. But not just because they are important This is a great series to read when you’re feeling down and you really need something humorous to lighten your day. So I’m not kidding when I say that the world is in need of books such as this one. The best thing is, these two main characters (Heart and Brain) are meaningful ones. But not just because they are important to the book itself. Actually, I love this series because it’s fun but also eye-opening. It talks about different issues in humorous ways. The author could have decided to only include silly, meaningless scenes, and I still would have enjoyed the book. Fortunately, he uses Brain and Heart to convey real life lessons to the reader. Though I don’t feel like the author introduces anything new in this sequel that wasn't already present in the previous volumes, so I wonder if this is the final book. 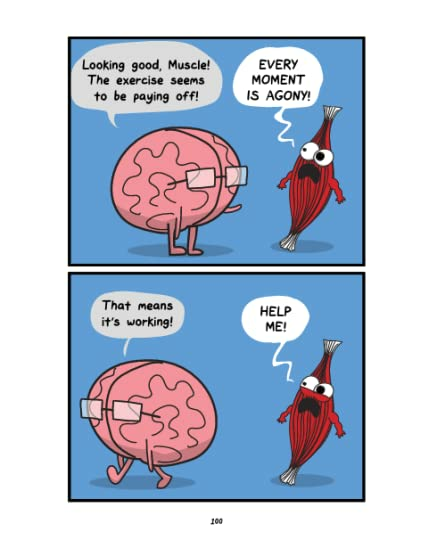 I have been following The Awkward Yeti on Instagram for a year...years...I don't know but its been a long time and I love his Heart and Brain comics. They are witty, ridiculously adorable, and funny! Sometimes even laugh out loud, crying funny! Definitely one of my fave comic artists! Thanks to Netgalley and the publisher for the book in exchange for an honest review. this story is sassy and funny. and I could screen shot all my favorites but I would never stop. so buy the entire book. if you buy an ebook get Aldiko for ease of reading ...this would stink as a kindle. I'm just a big fan of this webcomic, and it was everything I wanted it to be. Sometimes I relate more to the heart, and sometimes the brain. What really gets me is the panels/comics where I'm 110% both. Definitely recommend checking out this collection or the webcomic...or both. I still need to get my hands on the other two collections. So the second comic mentioned brownies and now I need brownies. You have been warned. I have seen many of these on tumblr before (likely about half) however I still really enjoyed this book. So much good stuff in here! Many of the comics speak to me on a deeply personal level. I got this for review on Netgalley (for free, for review, all that jazz including opinions are my own, you know the drill).